← Happy Holidays – Going On Vacation! Hey! Celebrate 2012 With A 20.12% Discount Off All Items In Our Zazzle Store! Normally I wouldn’t interrupt my vacation for something like this, but this is such a good deal, I had to pass it on. Starting today through January 4th you can get 20.12% off anything in our Zazzle Store using code 2012NEWYEARS when you check out online. 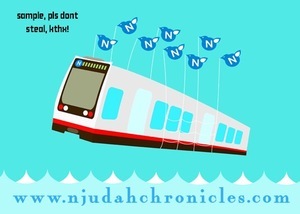 This includes the “N is Near” shirt, the extensive line of Muni Failwhale items, and more. Buy something today and show folks in 2012 how cool you are with your new apparel!